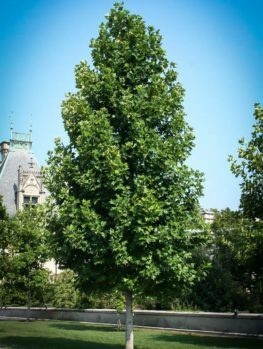 Quaking Aspen is a native American tree adapted to cold regions and a great choice for a quick growing and hardy tree to start your garden and fill in while other trees develop. It will grow 4 to 6 feet a year and quickly form its beautiful white trunk. 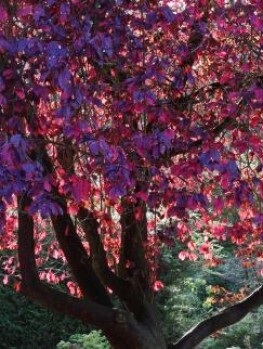 Before you know it you will have a beautiful tree in your yard. This tree is known for the beauty of its white bark and for the graceful way the leaves flutter in the slightest breeze. It will turn a lovely yellow in fall, sometimes with pink flushes as well. It will grow in the coldest, most exposed locations and at high altitude, so it is a great starter tree to give some protection for later tree planting. When you first start a garden, especially on an empty lot, it can be overwhelming. The soil may be poor and thin and you may have no shelter from the winds. If you are also starting out in a cold part of the country, your choices for trees can be limited. The best first step is to plant a tough, cold-resistant tree that will begin to create a landscape for you and an environment in which you can start a full garden. Quaking Aspen is the ideal choice for this. 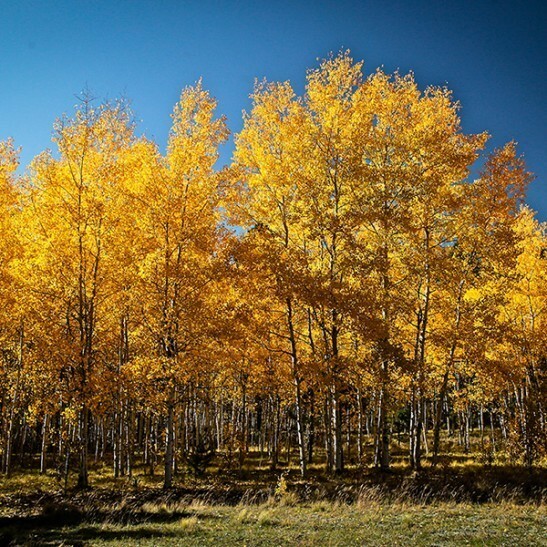 The Quaking Aspen will grow at a very rapid speed in the coldest and most exposed locations and provided it receives water it will even grow in poor rocky soil. Not only that, but it is a beautiful tree, with heart-shaped leaves that hang from the stems and flutter in the slightest breeze. The bark is a beautiful white color even in young trees and it does not get too big, reaching 40 feet or perhaps more, but growing hardly more than 20 feet across, so it doesn’t take up too much room. 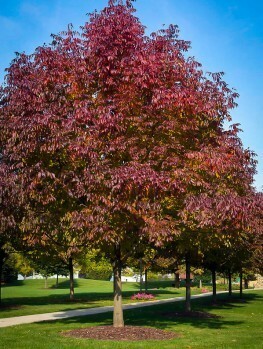 This tree makes a nice specimen in a lawn, but is even more attractive when planted in groups, perhaps 3 or 5 spaced around 6 feet apart, or as a row along your fence line or property boundary. 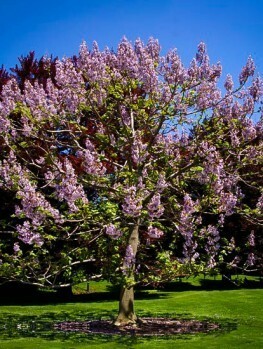 This tree will quickly give some privacy and definition to your yard and inspire you to plant more trees and shrubs to make a beautiful garden for yourself and your family. 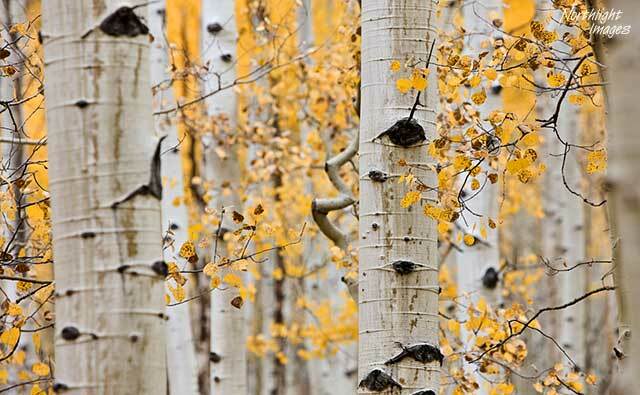 Quaking Aspen is a tree that grows very quickly, adding 4 to 6 feet of new growth per year when young. It will do well in poor soil but it is not drought resistant and does best if it has a reasonable supply of water. Although it can have some problems, if you water and fertilize your trees they will have few pests and diseases – these problems are usually the result of stress from dryness or heat. It is generally deer-resistant so it is a good choice if you are starting a garden in a rural area. It can also be planted on steep slopes, even those that face north and are exposed to cold. It will grow in rocky, thin soil and also on secondary areas with a lot of debris in the soil. 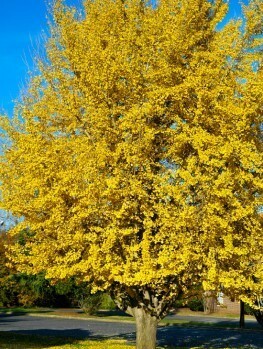 Quaking Aspen is hardy from zones 2 to 8 and really thrives in colder areas. So if you live in the northern states or at high altitude elsewhere, this is an excellent tree for you to grow and it will never suffer from winter injury. It will grow in most kinds of soil as long as they are not too dry. 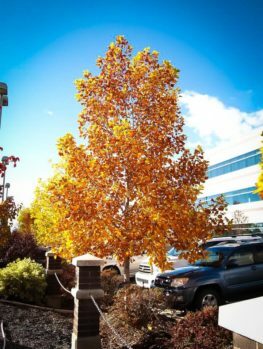 You will want to find a sunny spot, or one with just a little shade, for your Quaking Aspen. Your new tree needs room to grow, so plant it 15 to 20 feet from your house and any overhead utility lines. When planting as a screen or wind-break, allow 6 to 10 feet between the trees. Dig a wide, shallow hole about three times the diameter of the pot. Add some organic material like compost, manure or peat-moss and some tree fertilizer. Place the tree in the center of the hole, put back most of the soil and firm it down well. Even if you have rocky soil, if you can find a spot to add some organic material and make a hole big enough for the pot, then your tree with settle in and begin to grow quickly. Add lots of water and when it has drained away finish with the rest of the soil. Water well every week for the first season and after that when the soil is dry. Quaking Aspen grow fast and are healthy if they are watered regularly. It will not need pruning or other specialized care. 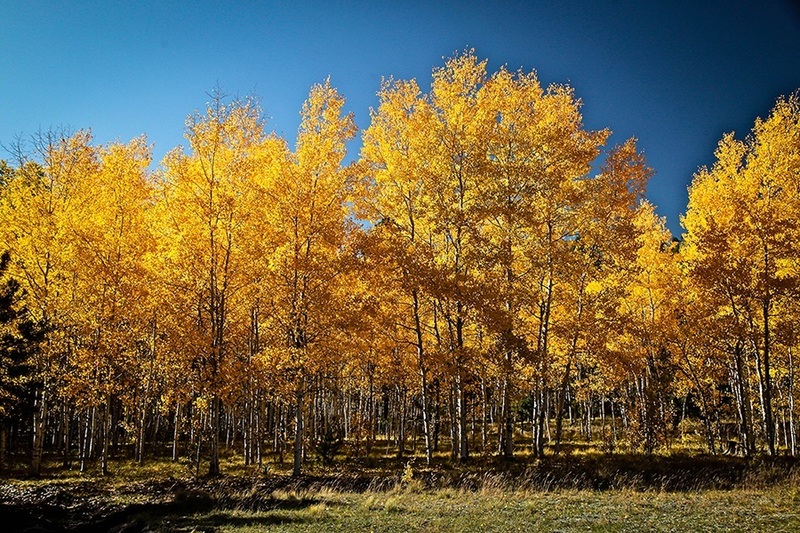 The Quaking Aspen Tree (Populus tremuloides) is found in the coldest regions of North America and in the US it grows naturally around the Great Lakes and in the north-eastern states as far south as Pennsylvania and New Jersey. It is also found at higher altitudes in the Rocky Mountains. This tree has a straight, upright trunk with smaller side branches so it remains narrow for its height. The bark is white to greenish-cream and has attractive black horizontal marks across it. The leaves are almost round, 2 to 3 inches across and hang from a 3 inch long flattened stalk, which is why they tremble in the breeze. When your tree is young the leaves will be larger, perhaps 6 inches long, and triangular in shape. 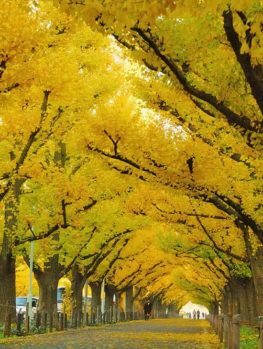 In fall the leaves turn a beautiful, clear yellow color, sometimes with a pink flush. The flowers come early, before the leaves and are thin like little tails hanging down in clusters. Trees are either male or female and female trees produce seeds that blow away in the wind. 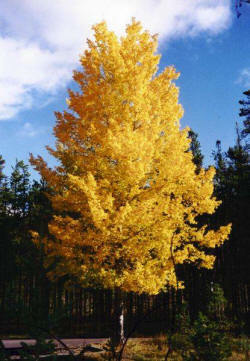 Quaking Aspen is a special plant and only the right tree will have the beauty and growth rate you are looking for. So, it must be produced directly from trees absolutely known to be correctly identified. 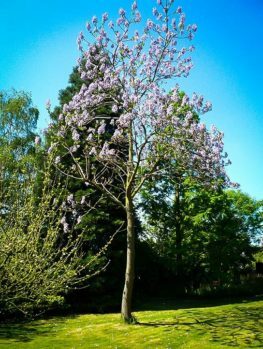 Our trees are grown the correct way, from seed gathered from these special trees chosen for their sturdiness and beauty. However these take longer to produce, so avoid cheaper trees that will only be a disappointment.